I loved kick the can. Racing up to send that can soaring and running on to hide again – I was born for that. Same for kickball. The ball was so big and soft, it wasn’t going to hurt anyone. Plus, you were aiming for the legs. All you needed to do was kick your hardest and run like crazy. Here’s the thing. To this day, I prefer to compete against myself. I prefer to beat my old time. I prefer to do a better job. I like to win, I have to admit, but I don’t want to win if I have to physically beat up the other guy. 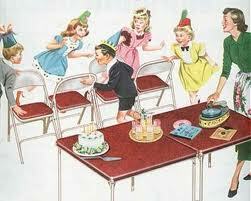 I think my aversion to musical chairs helps explains two things about me as an adult. For one, it explains why I love being a writer. My competition is myself. I can always work on my craft. I can always try for a new market. I’m comfortable putting my writing up against another writer. When I don’t get an assignment I want, I go through my work to see what could have been stronger. When I do get the assignment, I polish my work until it shines. The other thing it explains is why I’m so stressed when I’m living through a period of time that is particularly unpredictable. The good news is that I’m not a six-year old any more. I can put some things in place to offset the unpredictability. Still. Let’s face it. Six-year old me still freaks out that I won’t be where I need to be when the music stops. Definitely a good reason to have some chocolate on hand. What about you? What do your childhood game preferences say about you? Interesting! I always hated Kick the Can. It was fine if I was out hiding. But being IT was no fun because my brothers would come along and kick it while I was out hunting and then I had to start all over again. It was endless! What does that say about me? Hmmmmm – that I like to have a project that I can feel in control of. That if a project goes on for too long I can get bored with it. I think my favorite games were creative ones. Making playhouses and forts. Creating fantasy lives with my sister. Basically that comes down to writing stories….